So far davisdowntown has created 5 blog entries. A favorite of locals and visitors alike, the Davis Downtown Summer Sidewalk Sale, well into its third decade of providing sizzling deals on fabulous merchandise, brings folks from near and far to find their favorite treasures in Downtown Davis. The top RETAIL spender will win a $50 Davis Downtown Gift Card! Also, while you are downtown Friday, stay and explore 2nd Friday ArtAbout – Davis Downtown’s monthly, self-guided artwalk exploring 24 venues of art, live music, performances, wine, refreshments, and more! We’re Amy & Bill Habicht, owners of ABC-Davis (Amy & Bill Capture Davis). We specialize in letter photography and photo emulsion transfers on custom substrates. We strive to capture Davis and UC Davis in creative ways that highlight the beauty of nature and everyday life. ABC-Davis is a proud member of the Radiate Art Collective. by way of falling in love. 1999: a short boy and a tall girl fell in love and began exploring life together. At first what we noticed was how new the whole world looked. We dreamed big dreams and wanted to see everything. 2005: after graduate school in Richmond, VA, we packed up and headed west for our “real jobs” in Davis, CA. We began to slow down and notice the beauty of the seasons at the Farmers Market. Downtown Davis shoppers have the opportunity to get a bit more than simply the perfect gifts for everyone on their lists this holiday season. Shoppers who spend more than $100 at retail stores downtown may submit their receipts for purchases made between Nov. 29 and Dec. 24 by mail, fax or email. Mail them to Davis Downtown, P.O. Box 72497, Davis, CA 95617; fax them to 530-756-6504; or email them to info@davisdowntown.com. 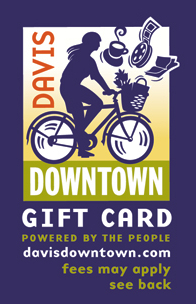 All those who submit receipts will be entered into a drawing for 10 $100 downtown Davis gift cards. They may be purchased in person at The Avid Reader, 617 Second St.; Avid Reader Active, 605 Second St.; or at the Davis Downtown office, 826 Second St., near the Amtrak depot. Davis Downtown office hours are Monday-Friday 11 a.m. to 4 p.m. Gift cards also may be purchased online using a PayPal account or credit card; visit www.davisdowntown.com. The cards are accepted at more than 200 downtown retailers, restaurants, salons, day spas and other service providers. Have questions or need a special order? Email: info@davisdowntown.com or call 530-756-8763. Can’t decide whether Aunt Marge would like a book from The Avid Reader, a Christmas ornament from The Naturalist or some tickets to the Varsity Theatre? Not sure what gift to give your child’s teacher or soccer coach? This summer my friend Nina wrote an article announcing our family’s intention to take a Staycation – a vacation without leaving town. Our plans conflicted first with Lance Armstrong, then with an army of parents delivering mini-fridges and high school graduates to UC Davis. So our summer Staycation finally took place in the first days of autumn, but this is Davis so it might as well be July until October, right? Staycation, 2011, woo-hoo! Due to soccer schedules we didn’t accomplish everything on our list (sorry U.S. Bicycling Hall of Fame), but we still painted the town in fine fashion. We started by checking into the University Park Inn, then took a walk Downtown for lunch. On our way, we visited our pal Nina who was hosting the Indie Davis craft fair, showcasing talented locals who are doing their best to make Downtown a creative, community-minded destination. Eventually we wandered back to the hotel for a swim. A few cannonballs and warm towels later we were showered and ready to walk back Downtown for dinner and ice cream. Soccer, swimming and all that walking made for a satisfying day and early night by vacation standards.